Sustainability is all the rage lately, and home and business owners are quickly taking note. Now is a better time than ever to invest in a home renovation using eco-friendly materials, and they’re easier to come by than you think. If you’re having trouble determining which materials offer the most eco-friendly advantages, you’ve come to the right place. Here are just a few of the most popular choices when it comes to eco-friendly and sustainable construction materials. The steel recycling and repurposing industry is absolutely booming, making steel an incredibly sustainable and versatile choice for a wide range of renovations. You can use steel in countless ways in your renovation since it already exists in various parts of residential and commercial buildings structure. You may also be surprised to hear that the reclaimed and recycled steel from about six junked cars gives enough steel to construct a house that’s about 2000 square feet in size. Though it’s not 100% efficient, recycling steel saves about 75% of its initial energy costs, making it a viable option. Insulated Concrete Forms, or ICFs, are also growing in popularity as a sustainable construction material. 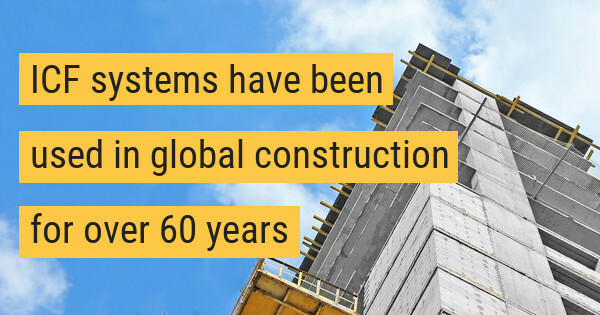 ICF systems have been used in global construction for over 60 years, and they offer countless advantages. According to the U.S. Department of Housing and Urban Development, Nexcem ICF walls can save homeowners 20% to 25% on annual heating and cooling costs. In addition, with Nexcem, you have the added sustainability of using recycled clean softwood waste material that would otherwise be destined for the landfill. This also reduces our carbon footprint by sequestering the carbon in the wood that would otherwise be ultimately released through natural decay of the waste material. Plus, buildings constructed with Nexcem ICFs are six to nine times stronger than traditional buildings. It’s safe to say that residential and commercial buildings alike can benefit from all that Nexcem ICFs have to offer. Nexcem concrete form construction is efficient and sturdy every step of the way. Finally, bamboo is a versatile material that’s stronger than it seems. It’s often used underneath other structures in order to strengthen them. “Bamboo has a great deal of tensile strength and can be used in walls and flooring. It is an ideal building material because it can be used behind the scenes — underneath another type of flooring, for example — and as wall screens and mats,” writes Megan Wild on Mother Earth News. Now that you’re aware of the benefits of concrete form construction and other sustainable materials, you can make an informed and eco-friendly decision for your residential or commercial building renovation needs.